There was a time when a college degree was virtually the sole measure of job-readiness. That time is gone. There are simply too many other, more effective ways to find and vet crucial talent. That’s not to say a college degree can’t be a key factor; it can. But in today’s hiring environment, the need for specific skillsets is too intense, the pace of change too rapid, the competition too fierce. Companies often need truly rarefied talent, and they’re realizing a college degree is no longer the best determinant of suitability. Agility and flexibility are vital, real-world experience, critical. There is a genuine need to reevaluate hiring practices, and the most innovative companies are already doing so. Academic Readiness vs. Job Readiness? 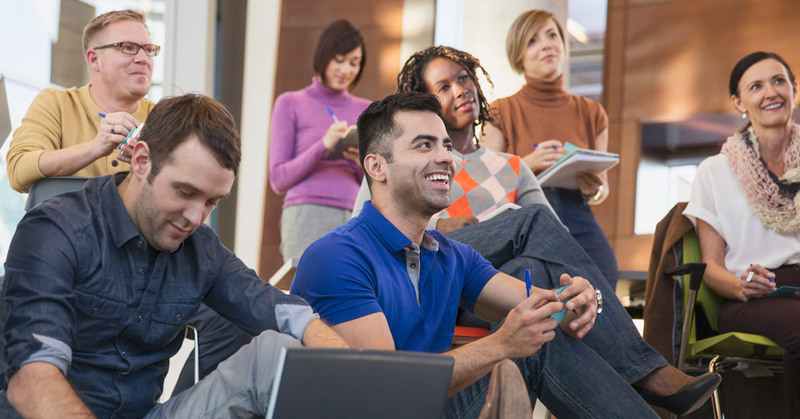 A 2014 Gallup poll surveying business and university leaders, showcased a deep disparity between how the two groups viewed the preparedness of recent college grads. 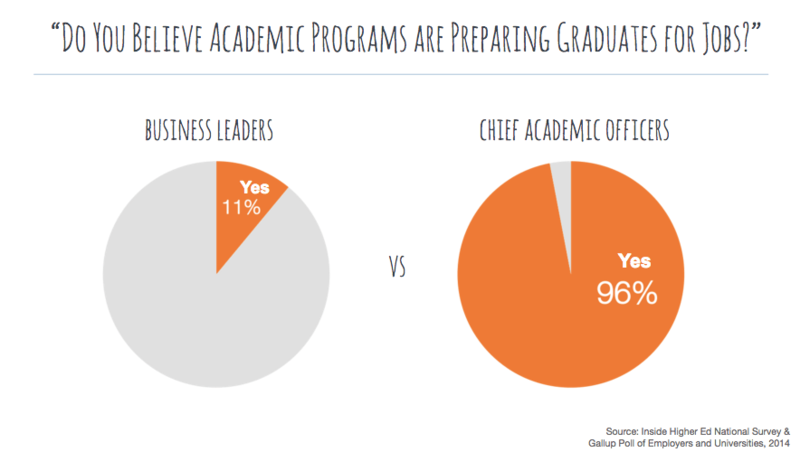 When asked, “Do you believe academic programs are preparing graduates for jobs?”, 96% of Chief Academic Officers said “yes”. Only 11% of business leaders agreed. Because of this stark contrast, companies have realized that they need to look for candidates who have mastered the in-demand skills they need either through independent study or through rigorous training programs. This highly focused approach to learning may translate into better performance on the job, which is why more and more companies are taking a hard look at their hiring practices, and the truly innovative companies are taking revolutionary steps to change their approaches. They are shifting their focus towards skills and experience, as opposed to university degrees. Last year, the UK branch of Ernst and Young (EY) made some waves within the HR space. A college degree will no longer be listed as a requirement in their job postings. “[We] found no evidence to conclude that previous success in higher education correlated with future success in subsequent professional qualifications undertaken,” EY said in a statement. The company realized that by requiring a degree, they were potentially shutting out excellent candidates and narrowing their talent pipeline. Flipkart is also taking a new approach to hiring. They have embraced the idea of “interviewless” hiring and are, instead, evaluating candidates based solely on their skill sets and portfolios. Taking this approach “allowed us to assess the candidate’s competencies in a much better way,” said Flipkart’s CTO, Peeyush Ranjan. By omitting arbitrary hiring requirements and by focusing on the skillsets and attributes that are imperative to the position they are hiring for, Flipkart is able to hire better candidates, faster. This is helping them to overcome the talent shortage and to continue innovating. So, if you’re hiring, how can you make sure that you aren’t turning away the perfect candidates for your company? Don’t rely on the status quo. Experiment and devise progressive strategies to attract different candidates from new pools. If your company is apprehensive about change, you can implement small trials at first. Connect with a forward thinking hiring manager and vet candidates based on differing criterias. If it is successful, you will have the data you need to expand the program. Make sure your recruiting team is using solid data and metrics to evaluate its hiring practices and performance. Take a close look at which candidates get the jobs and how well they succeed in their roles. Look for common themes and employ a strategy based on the results. Make sure that your job postings focus heavily on the responsibilities and duties of the roles that you are hiring for. Provide detailed accounts of what the role will look like and the skills necessary to succeed in the role. Remove the fluff that could dissuade the perfect candidate from applying. Should companies rethink their hiring practices and open up job postings to those without degrees? The short answer is, yes! A candidate’s credentials are only one way to evaluate a her readiness for a position. By rethinking your hiring practices and focusing on the aggregate of a candidate’s skills and accomplishments, you can attract more top talent and increase your chances of finding the perfect hire.